Few documented routes exist in Chile's Millalifen range, a granite massif rising over the sacred valley of Curarrehue, located in Parque Nacional Villarrica, near the Chilean-Argentine border. 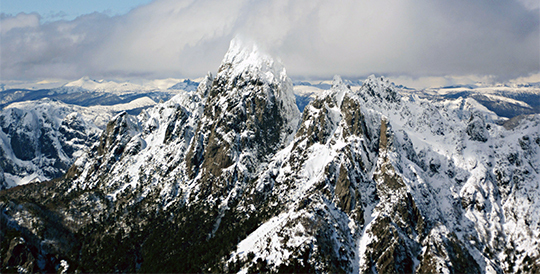 The Millalifen massif, also known as Las Peinetas ("The Combs"), is a formation of towers and spikes rising more than 2000 meters, with sheer walls of up to 500 meters soaring over Chile's Trancura river valley. 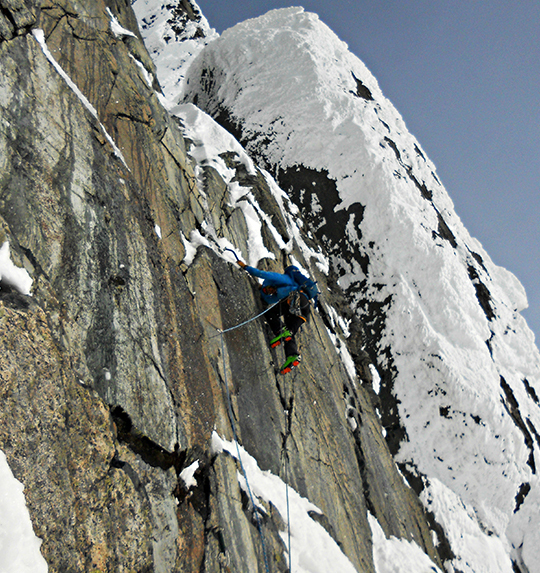 On the morning of August 14, Chilean mountain guides Juan Senoret, Leonardo Bastias and Gabriel Navarrete visited the area to make their third attempt at the first winter ascent of the 2090-meter Aguja Principal ("Main Needle"), via the Normal Route (M4 AI4 85 degrees, 300m), which ascends the massif's primary spire. The team traveled light, in what Senoret dubs "New Andinism" style, carrying a small rack up to a #2 Camalot, four ice screws, two snow stakes and two 60-meter ropes for six pitches of sustained M4 climbing. "More courage, less technology and pure adventure...it's just you and your pack to the top and back," Senoret told Alpinist over email about his climbing philosophy. Solid ice on the lower pitches gave way to mixed climbing with little protection higher on the main headwall followed by a non-technical finish. They completed the route in 14 hours round-trip. Their August ascent of Aguja Principal is the first recorded winter ascent in the Millalifen range.